This Thursday a new monthly sparkle event begins at the Maple Parlor! 12-3pm, 3538 SE Hawthorne blvd. 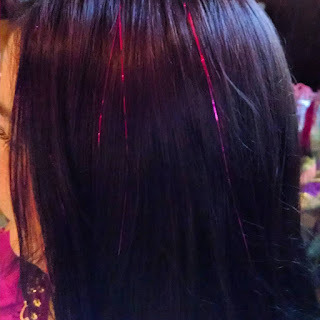 Every 3rd Thursday we'll have Faery Hair at this organic probiotic ice cream shop! They have tea and coffee too, yum! Thursday, December 15th: 12-3pm, 3rd Thursday Faery Hair at the Maple Parlor, 3538 SE Hawthorne, Portland, new monthly event! Saturday, December 17th: 10am-5pm, Faery Hair for Geek the Halls craft fair, 1000 NE Multnomah St, Portland, free event! Sunday, December 18th: 6-8:30pm, Faery Hair for Gypsy Heart Winter Solstice celebration, Tango Berretin, 6305 SE Foster, Portland, $5 entry. Friday, December 30th: 11am-6pm, Faery Hair Friday at the Fernie Brae, 4035 SE Hawthorne, Portland, drop in! Saturday, December 31st: Faery appearance/performance by Serafaery and Pixie at Vancouver's New Year's Eve at the Hilton Masquerade in the Round! This faery's wings are beating fiercely to bring you all the sparkles! Thank you so much for keeping me so busy!